In the span of just a few days in June, President Donald Trump became the first U.S. president to refuse to sign onto a statement of the G-7 leaders as well as the first sitting American president to meet with a North Korean leader. These two encounters have shaken the foundations of U.S. foreign policy and may irreversibly damage America’s security and prosperity. Specifically, they have signaled that the United States under Trump will disregard its closest allies and embrace the world’s most brutal dictators. For months, President Trump has chipped away at America’s role as a global leader. He has withdrawn the United States from both the Iran nuclear deal and the Paris climate agreement and has praised dictators such as Kim Jong Un, to name just a few examples. However, in the past few weeks, the events of the G-7 and Singapore summits may have triggered the beginning of a fundamental break between America and the alliances and democratic values that have grounded U.S. foreign policy for decades. And in the coming weeks, there is the potential for even more damage as Trump visits Europe in July for a state visit to the United Kingdom, the NATO summit in Belgium, and a U.S.-Russia summit. In only 17 months in office, President Trump has managed to scuttle decades of hard-won U.S. global credibility and has swung open the door to China and Russia, two countries that will seize the advantage at the expense of America’s security and economic interests. At the beginning of his presidency, Trump and allies tried to get along. Following usual protocol, European leaders came to the Oval Office for photo-ops with the new U.S. president. And while Trump continued to take jabs at allies on trade, defense spending, and migration, it looked possible for the alliance to weather the storms. 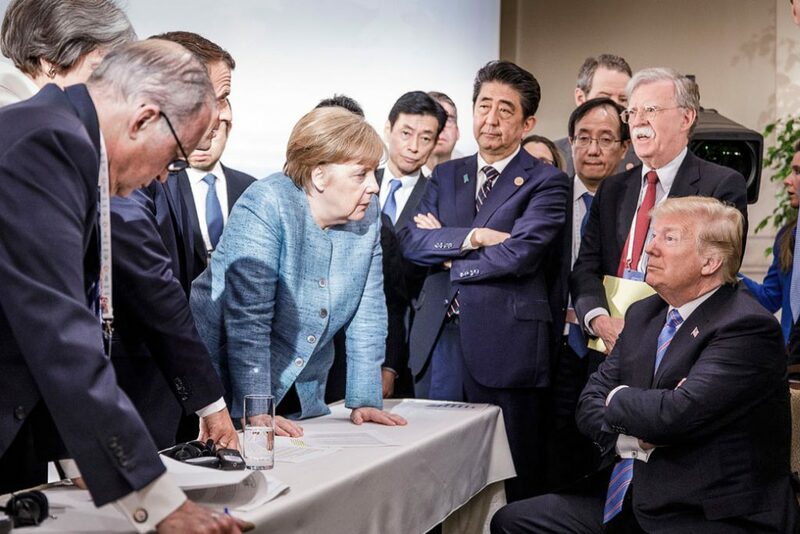 As Trump trashes democratic allies—and the United States imposes tariffs on Europe, Canada, and Japan, which could start a trade war with America’s closest friends—the transatlantic alliance may be entering an unprecedented period of strain. As German Foreign Minister Heiko Maas said, “the Atlantic has become wider under President Trump.”10 This trend risks playing right into Russian President Vladimir Putin’s strategy of weakening democratic Europe and inducing doubt in U.S. alliances. Similar shifts may be occurring within America’s alliances in Asia. During his press conference immediately following the summit with Kim Jong Un, Trump announced—to the surprise of his South Korean allies—that he would be canceling U.S. military exercises with South Korea. He even went further to call those exercises “provocative,” which is how North Korea describes them.11 While South Korean President Moon Jae-in supports U.S.-North Korea diplomacy, that support is driven in part by fear of Trump’s derision for the alliance. Moon recognizes that South Korea has a new interest in reducing tensions with North Korea, namely the unreliability of the United States under Trump to defend South Korea. While stopping military exercises could help to lower tensions, it seems, at the very least, likely to weaken the U.S.-South Korea alliance, which, in turn, will make any policy on North Korea less effective. Japan, too, is concerned about Trump’s direction. After a year and a half of Japanese Prime Minister Shinzo Abe’s attempts to court Trump, Abe is realizing that he has nothing to show for it. Trump is hitting Japan with tariffs and moving ahead on North Korea without Japan, leaving Japan vulnerable vis-a-vis North Korea in the near term and China in the long term. While alliances are the bedrock of U.S. and global security, democratic values have long been the moral compass of U.S. foreign policy. Trump is abandoning these values at an accelerated pace. At home, he makes clear that he does not value the laws and norms that have made America a role model of democracy around the world; his policy of forcibly separating the children of immigrants at the border and his attacks on the judiciary, free press, and law enforcement are but a few examples. U.S. power relies on much more than economic and military might. America’s ability to achieve its national security goals depends on the world perceiving it as a different kind of leader, a country that has both the power and the will to do good in the world. Trump, however, has unilaterally disarmed America of its most powerful foreign policy tool in exchange for being considered one of the cool kids by the world’s worst bullies. What’s next, appeasement of Russia? Next up on Trump’s agenda may be appeasement of Russia. President Trump’s admiration for Russian President Putin is well-known. Trump’s campaign colluded with Russia to gain its help in winning the 2016 presidential campaign; and since taking office, Trump has tried to explain away Russia’s aggression in Europe and its interference in American politics. Parroting talking points that could have been written in the Kremlin, Trump justified Russia’s illegal annexation of Crimea from neighboring Ukraine and called for Russia to be readmitted to the G-7.14 Trump has long argued that he wants America to have a better relationship with Russia, which is a reasonable goal, but, in achieving that goal, he appears willing to ignore the ongoing threats that Russia poses to U.S. and international security. However, of late, Trump appears more inclined to follow his instincts, and his admiration for Putin could drive him to sell out American interests in July. If a Trump-Putin meeting results in the United States continuing to overlook Russia’s ongoing invasion of Ukraine, its stoking of conflict in Syria, and its ongoing attempts to interfere with American elections—including this year’s midterm elections—it could result in lasting damage to U.S. national security interests. When it comes to foreign policy, successes and failures can materialize slowly. It can take months or years to damage alliances and sometimes even longer to witness the tangible fallout of those broken relationships. However, it is clear that President Trump is speeding toward a scenario in which our allies will not trust us and our adversaries will not fear us. Expect more of this to come. Pushing allies away could sap popular support in allied countries to assist American efforts to take on national security challenges in Afghanistan, the Middle East and North Korea. After the attacks of 9/11, Europe invoked Article 5 of the NATO charter, claiming that an attack on America was an attack on all members; and NATO responded by joining the United States in war in Afghanistan. The next time America is attacked, Europe may not respond in the same way. While it takes a lot to break an alliance, if the United States does not change course, it risks isolating itself and undermining its alliances to the point where its allies will think that it is the problem. One can imagine policymakers in the capitals of U.S. allies asking themselves: Can we trust America? Do we need to begin hedging against America by cutting deals with China and Russia? Yet it is possible. It is often said that “you don’t know what you’ve got until it’s gone.” America may be about to find out exactly what it has lost if it does not get back on track by working closely with its allies and upholding its democratic values. Kelly Magsamen is the vice president for National Security and International Policy at the Center for American Progress. Michael Fuchs is a senior fellow at the Center.